This article is 3264 days old. CTD 2010 Hosted by IT Steering Committee and IT Services at the University of Windsor. 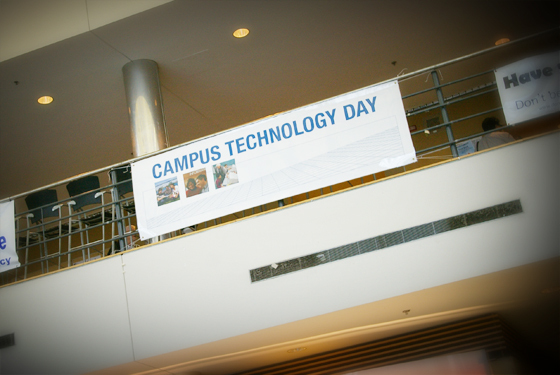 This past Thursday, the University of Windsor was teeming with talk of Engagement through Technology during the 4th Annual Campus Technology Day 2010. Members of the faculty and staff, community, and students took part in this day long conference highlighting technology’s impacts on various aspects of education. Topics covered a broad range of areas including teaching, learning, and student engagement through technology. Campus Technology Day's keynote speaker George Siemens at Toldo Health Education Centre. While keeping within the day’s theme, keynote speaker George Siemens of Athabasca University in Alberta presented his discussion and slides remotely via video conference in Toldo Health Education Centre. Thanks to the hosts in the IT Steering Committee and IT Services, the presentation including the Q&A portion took place without a hitch despite the 3,000 km distance between Siemens and his attentive audience. 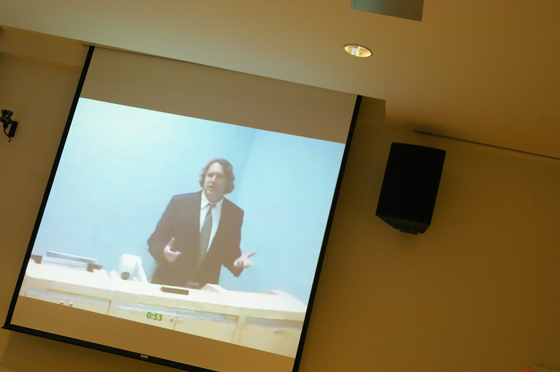 George Siemens addresses the audience from Athabasca University in Alberta. Siemens’ innovative ideas on the impact technology could have in a university setting is one of great relevancy and particularly engaged the audience despite his physical absence. The Q&A that followed was also poignant to current developments and concerns in the field. Overall his presentation was a great way to begin the conference activities. You can find Siemens’ keynote slides by clicking here. 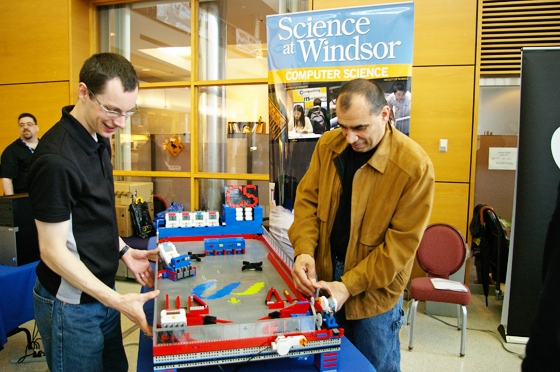 The Computer Science department presents a pinball machine made of Lego. After a short coffee break alongside poster presentations in the the university’s CAW Student Centre, participants made their way to the second floor for a a wide variety of sessions. The 11 presentations covered a broad range of topics in an effort to encourage a technologically enhanced campus community. From eCommerce to Facebook, topics were fascinating and initiated discussion among participants and presenters throughout the day. The events were capped off with a wine and cheese reception for the participants and presenters. 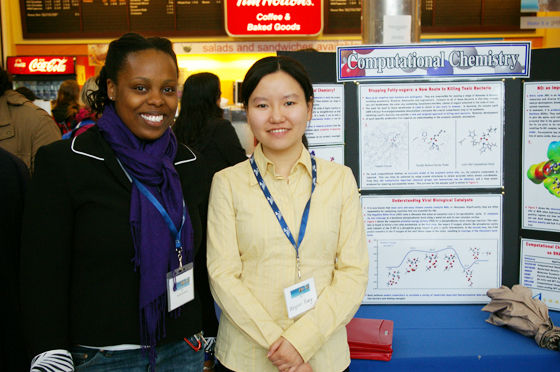 Graduate student presents Computational Chemistry poster to me at Campus Technology Day. 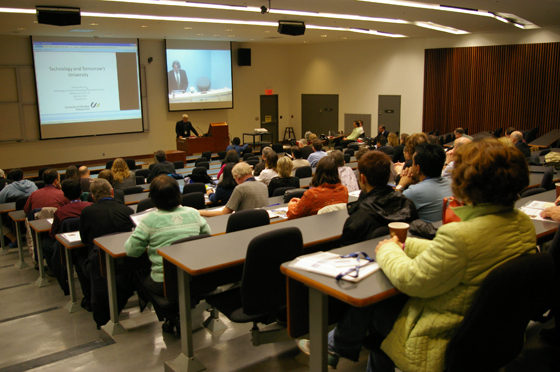 The University of Windsor’s 4th annual Campus Technology Day 2010 was a great success and is indicative of the direction that the city is headed. Students of the university are very likely to benefit from the information shared at this conference as faculty, staff, and all Windsorites seemed willing and ready to learn about what today’s technology has to offer the campus.